I am not TS Hendrik. I only mention that unfortunate fact (I mean, who doesn’t wish they were TS?) because he lives in Tennessee, and I in Virginia, and currently Virginia is all over the news, and nobody gives a lick what’s happening in Tennessee right now. And in case you haven’t been watching the news, or visiting Facebook, or checking trends on Twitter, or basically been on the internet at all since 1:51 pm (EDT) today, let me fill you in. Virginia burped. Specifically 3 miles below some farm in a town I’ve never even heard of called Mineral, Virginia. Now, I’m always extolling the superiority of my home state, (to the irritation of people in lesser states, which is mostly why I do it) but you have to admit, after today’s events, it’s clear that when Virginia speaks, everyone listens. A little spot in some dude’s corn field in the middle of Virginia is on every major news station. That's how we roll. It doesn't matter that it was only a 5.8 quake, or that California is rolling their eyes at all of us, when we shake our corn here in Virginia, buildings in DC and New York are evacuated. You can't buy that kind of respect. Then there’s the matter of how all of this effects my manhood. You know how most women almost always remember what they were wearing during dramatic events? And how men don’t? We usually remember where we were or what we were doing, but our clothes? Never. Princess Diana’s death? I was in the kitchen when I heard, but I have no clue what I had on at the time. My wife and sister do. 9/11? Susan even remembers what others around her were wearing, and I can’t even remember if I was wearing socks. Same goes for the space-shuttle challenger disaster, the Oklahoma City bombing, and my brother beating me at Yahtzee. But this earthquake? I will definitely remember what I was wearing. This is a predominately female characteristic, so this seems to be threatening my manhood. Well, it doesn’t, due to the simple fact that as a guy, I will remember where I was at the time. You see, I was in the shower. I called in sick this morning, and later decided that a shower might help snap me out of my funk, which turned out to be a phenomenally successful decision. If you ever have the chance to take the kind of shower where the curtains sway and the soap falls off its ledge, I highly recommend it. 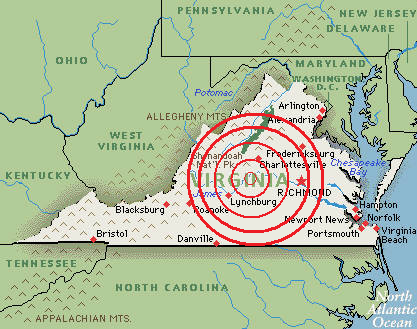 But other than a stack of books falling (that were so poorly positioned, a well-placed sneezing flea could have done it), that was the full extent of my 2011 Virginia Earthquake experience. So were you wearing your bathing suit or birthday suit in the shower? This is me, rolling my eyes;) Seriously? We don't even get out of bed unless it's above a 7. In all fairness, I do get that today was something completely new to ya'll. I did wonder a bit if your buildings could take the rocking and rolling. P.S. Maybe it was God's way of getting you to stop singing in the shower? I was at work, so I was wearing work clothes. I've since taken them off, so no idea which ones. We felt it at my office! Really wild. Everything on my desk moved. We have a had a couple here is Texas but it takes a lot to impress (and move) a state this big. Are you leaving us in suspense, Rep? Tell us what you wear in the shower. I feel you! If Minnesota even got a 4.0 or possibly even a 3.0 we would be all excited about it too. Ja sure you betcha! Und it would be da scary thing too!